AmmoBammo.com, an all-new auction website for guns, ammo, and gear, has just opened for business. This new site boasts “no listing fees ever”. Unlike Gunbroker.com, AmmoBammo has a very simple payment structure. There is no “up-front” listing fee, and no membership fee. If an item sells, AmmoBammo takes 2.5% of the proceeds — no matter what the price. That makes it easy to figure out what it will cost to sell your gun or gear. If nobody bids, or the bids don’t reach your thresh-hold reserve price, you pay nothing. If your product sells, you pay a flat 2.5% final value fee. That seems reasonable to us. Read detailed terms of sale here. To celebrate its launch, AmmoBammo.com is offering a special promotion. Now through July 15, 2013, AmmoBammo is Waiving ALL Fees on auction listings, including the normal 2.5% final value fee. So, for the next couple of weeks you can sell your stuff, and not pay a penny. Since this site is brand new, listings are sparse to say the least. As of June 25, 2013 at 12:00 pm, not a single gun was listed for sale (though there were many ammo listings). Hopefully the AmmoBammo site will gain traction as more sellers list their merchandise in the weeks and months ahead. Share the post "New Low-Cost Auction Site for Guns, Ammo, and Accesories"
A new ammunition manufacturer has started up in Stevensville, Montana. ProGrade Ammunition will be offering a wide spectrum of ammo products, with components selected for particular types of shooting. Prograde will eventually offer nine separate types of pistol and rifle ammunition: Defense Grade, Varmint Grade, Cowboy Grade, Hunter Grade, Bear Grade, Range Grade, Match Grade, Safari Grade and Tactical Grade. Our readers will probably be most interested in the “Match Grade” and “Varmint Grade” lines. 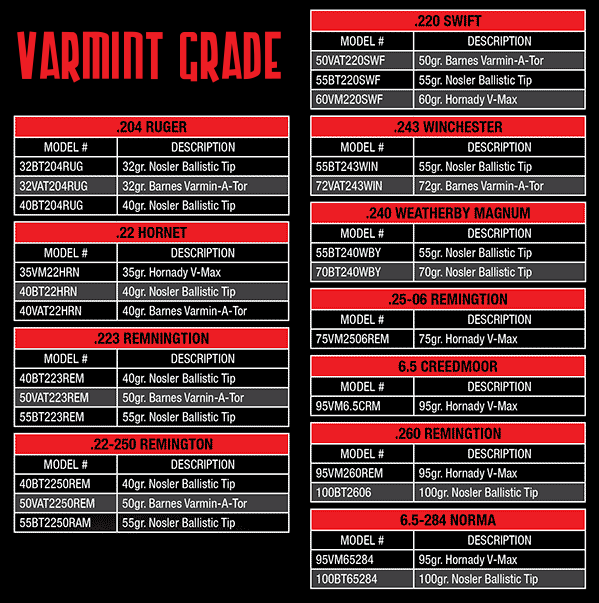 The Match Grade ammo features mostly Berger bullets (with some Noslers and Sierras), while Varmint Grade ammo is loaded with Barnes, Hornady, and Nosler bullets. Time (and rounds on target) will determine if ProGrade ammo is good stuff. But in this period of shortages, with ammunition of all kinds being hard to find, it is good to see a new domestic ammo-maker getting into the business, and producing cartridges with high-quality projectiles. We wish the folks at ProGrade success in their endeavor. 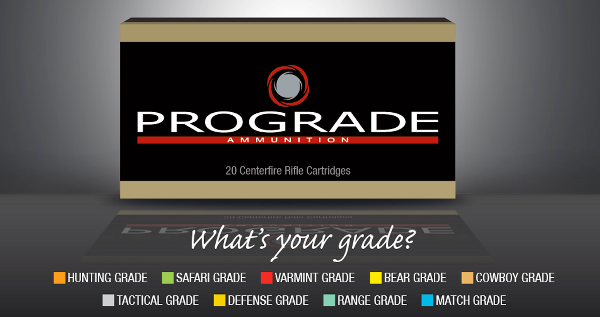 To learn about ProGrade’s full line of ammunition, call (435) 865-5995, or visit www.progradeammo.com. 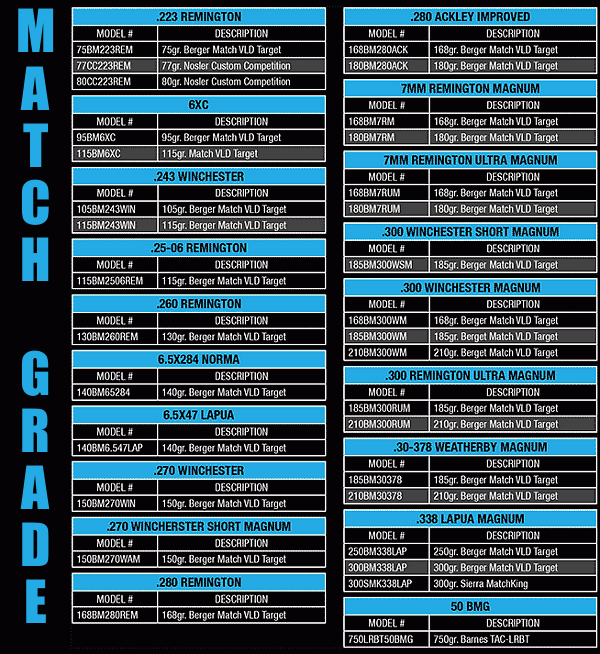 Share the post "ProGrade Ammunition Builds Loaded Ammo with Premium Bullets"